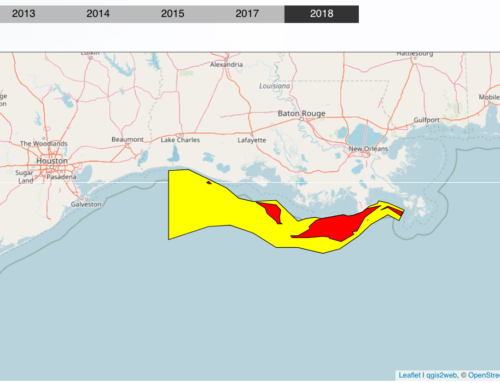 During the summer of 2017, researchers with the Louisiana Universities Marine Consortium (LUMCON) and Louisiana State University mapped the largest dead zone in the Gulf of Mexico to date. The Gulf of Mexico meets the shorelines of Alabama, Louisiana, Mississippi, Texas and western Florida and is home to a large fishing industry. 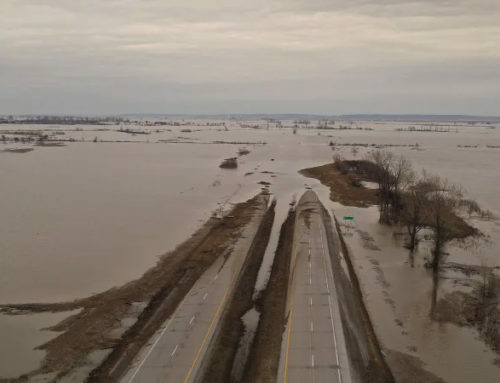 Several rivers from the Midwestern watershed flow south into the Gulf, carrying with them sediment, nutrient loads and pollution from fossil fuel burning and wastewater systems. The problem isn’t new, but it is expanding. Nancy Rabalais, a marine ecologist, and professor at Louisiana State University. 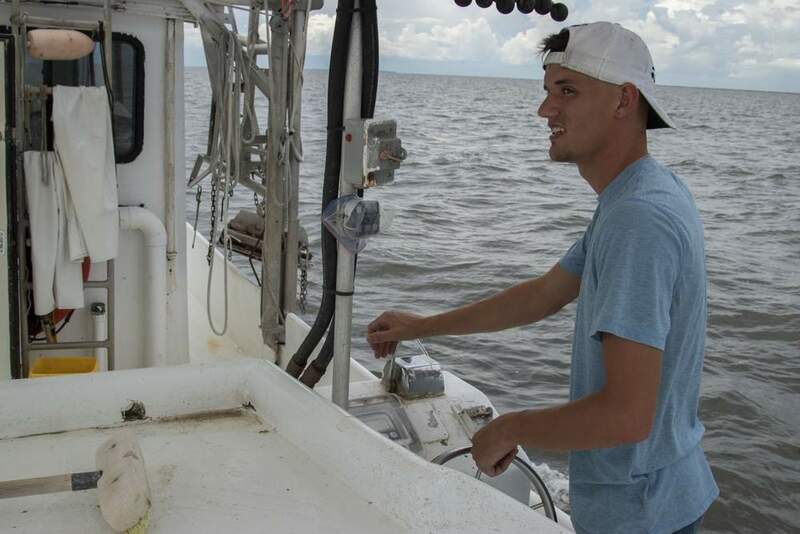 Rabalais, who also holds a position with LUMCON, has led the annual Gulf of Mexico research trip since 1985. 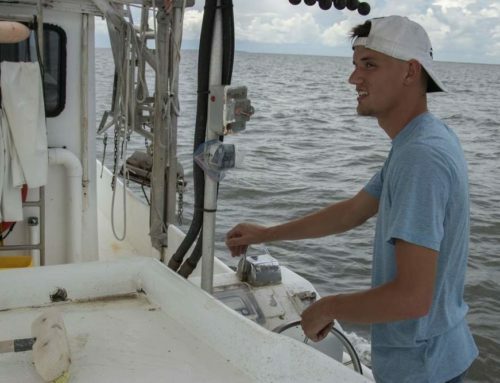 Each year with funding from the National Oceanic and Atmospheric Administration, Rabalais leads a small team of scientists on a weeklong boat trip around the Gulf of Mexico to gather data. 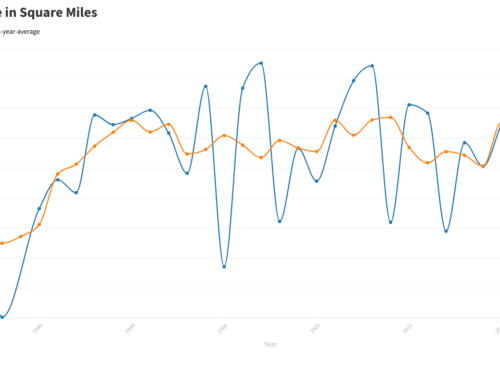 Over the last three decades, the team gathered data in an ever-expanding dead zone spanning from May through October. According to NOAA, a dead zone is a low-oxygen area in an ocean or a large lake caused by nutrient pollution from human activities and other factors that deplete the oxygen required to support most marine life. Each year the U.S. Geological Survey office releases a report on the nutrient loading levels from October to May. Scientists use the data in the report to develop a size estimate of the dead zone in the Gulf of Mexico. With that estimate in hand, the LUMCON team spends a week out in the Gulf gathering samples. For the trip, the team uses LUMCON’s research vessel, the R/V Pelican. The Pelican is a 116- foot oceanographic research boat that is designated as a Universities National Oceanographic Laboratory System vessel. Its capabilities include scientific trawling, large box core sampling, shallow seismic surveys, plankton sampling, and underway sampling with towed water sampling. Users of the vessel are able to select scientific equipment based on research goals. 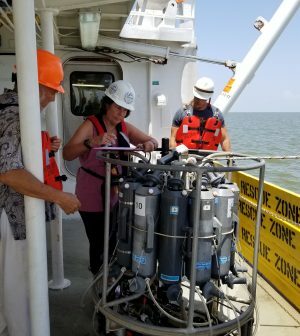 During the Gulf of Mexico trip, Rabalais’ team conducted both water and sediment sampling from 90 data points along the Louisiana coast between the Mississippi River and Galveston. The team used a Sea-Bird Scientific SBE 32 carousel water sampler with a CTD and 12 Ocean Test Equipment Niskin bottles. The system was lowered into the water at each data point and was electronically programmed to measure water quality and close the bottles at specified depths to collect samples. The team also used a box corer to collect bottom sediment and a simple bucket drop to collect surface water for suspended elements. All of the water samples were tested for inorganic nutrients and chlorophyll. The team also checked salinity and dissolved oxygen levels. “The inorganic nutrients like nitrate, ammonia, ortho-phosphate, and silicate stimulate phytoplankton growth,” said Rabalais. “Phytoplankton contributes to high carbon levels at the bottom and its decomposition leads to low oxygen.” Once the oxygen level drops below two milligrams per liter, the area is uninhabitable by marine life. The fish and shrimp will migrate to another area if they can, but those that can’t flee will die. During this time, a fishing trawler will not catch any fish in its net. “This year we saw very low oxygen levels, less than 0.5 milligrams per liter at the nearshore area,” said Rabalais. 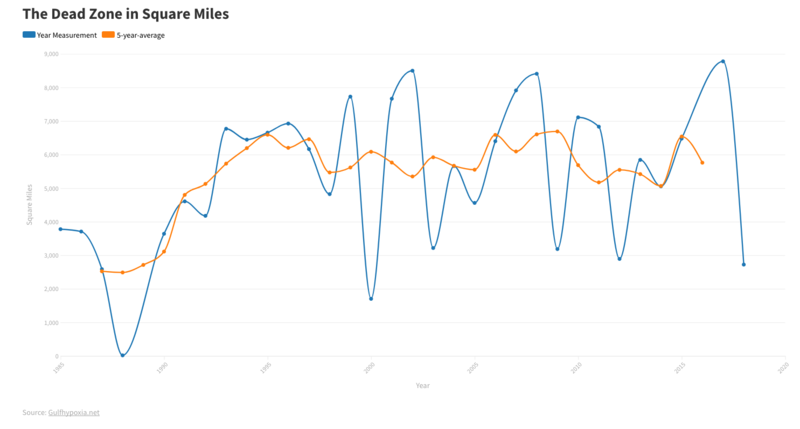 The dead zone on the 2017 trip measured 8,776 square miles, less than the 10,089 originally projected, but was still roughly the size of New Jersey and the largest to date. The average size for the last five years is 5,806 square miles. 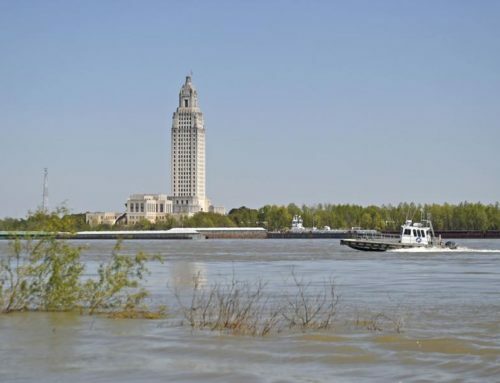 “The dead zone this year was 4.5 times larger than the Mississippi River Nutrient/Hypoxia Task Force’s goal of 1,900 square miles,” said Rabalais. Using the data from each of the 90 sampling locations, the LUMCON team creates a map of the dead zone. 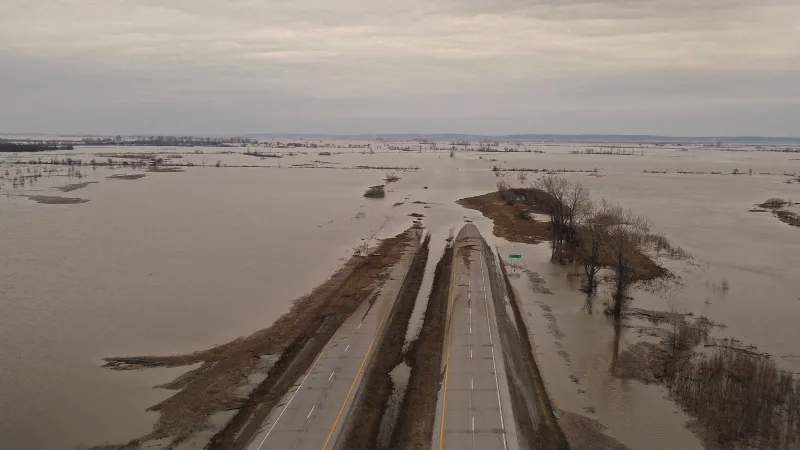 The data are used by the Mississippi River Nutrient/Hypoxia Task Force whose mission is to mitigate nitrogen and phosphorus loads in the river. NOAA and the Environmental Protection Agency also use the data. The National Center for Environmental Information makes the data available to the fishing industry as well. With more than 30 years of data to support the growing dead zone and its causes, one may assume that fixing the problem is a given. That doesn’t appear to be the case. In the meantime, the seasons continue to change bringing an end to the dead zone each year. When cold fronts or hurricanes move in, the water turns over and then there is plenty of oxygen. The fish and shrimp will return even if the ecosystem isn’t fully functional. There is also a possible limit to how large the dead zone can be due to dilution of the nutrients or the strength of the stratification further offshore. But although the size could be limited, the oxygen levels can still plummet. Long-term changes to the situation require a change in the use of nitrates in agricultural practices. Until that happens, Rabalais remains committed to documenting the situation. “I hope that the trip funding continues to be available because it decreases every year,” said Rabalais. 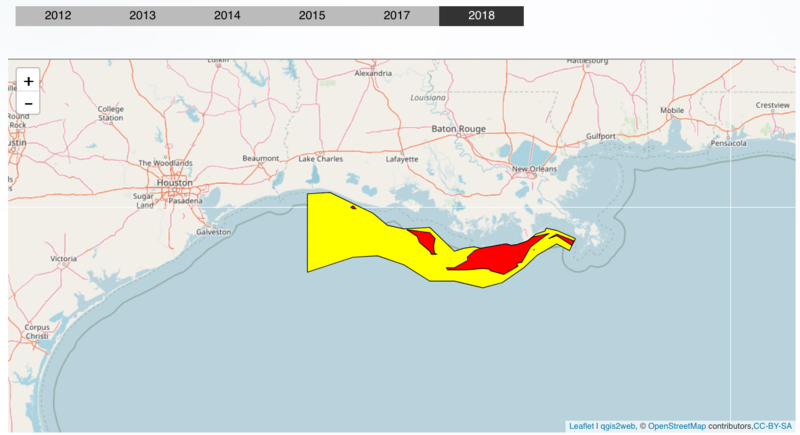 “If you don’t know how large the dead zone is, you can’t make management decisions.” The 2017 Gulf of Mexico dead zone map. The map was created with data collected by the LUMCON research team. MC 116 -foot long oceanographic research boat named the R/V Pelican Dr. Nancy Rabalais and members of the LUMCON team prepare to deploy a Sea-Bird Scientific SBE 32 carousel water sampler with a CTD into the Gulf of Mexico.